Nippon Toki Gomei Kaisha was presented with just a small piece of insulator. 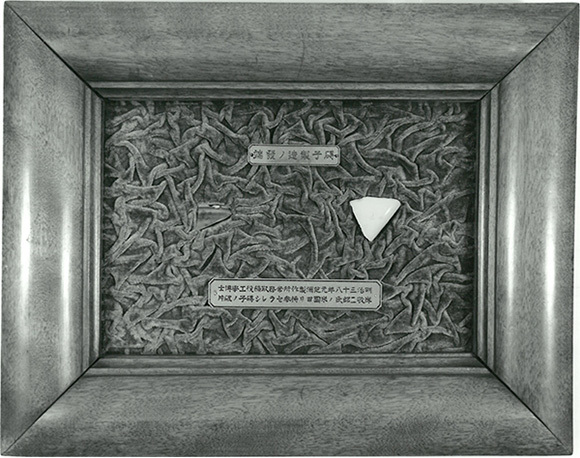 It was an insulator fragment brought back from the United States by Keijiro Kishi at Shibaura Seisaku-sho (present-day Toshiba Corporation). Kishi believed it was an outrage that Japan had to buy power transmission insulators from overseas despite Japan having traditionally been an outstanding producer of ceramics, so he sought out partners for domestic production of special high-voltage insulators. 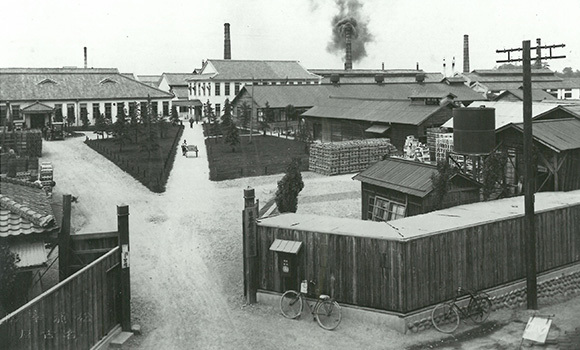 It was Nippon Toki that Kishi made a proposal to, but Ichizaemon Morimura, who led the Morimura Kumi to which Nippon Toki belonged, initially objected to the plan because ceramics production, their core business, wasn’t on track, and they didn’t have the electrical engineers they would need. Nevertheless, in the end, the company began manufacturing insulators with the conviction that “we do this to serve our country, and not for our own profit,” as Kazuchika Okura later reminisced. Before long, the special high-voltage insulators jointly developed by Nippon Toki and Shibaura Seisaku-sho demonstrated performance that surpassed those manufactured outside Japan, and demand skyrocketed. In response to these developments, the decision was made to spin off the insulator department, and on May 5, 1919, NGK INSULATORS was established. The factors that motivated our company’s establishment were the strong conviction toward domestic production and the courage to be independent. This spirit was the motive force behind the establishment of not only our company, but also the various Morimura group companies. 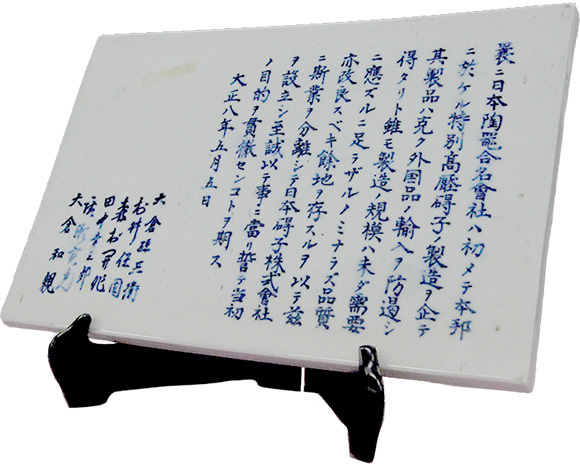 The “Foundation Oath” on a ceramic tile resting on the foundation stone of round kiln No. 1. When Nippon Toki was founded, Japan had no choice but to depend on importing high-quality sanitary ware. 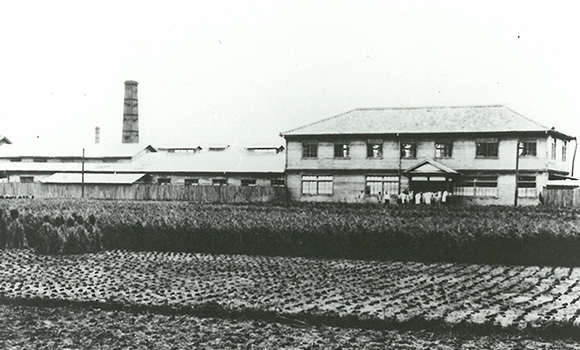 Magobei Okura and his son Kazuchika were enterprising individuals who founded TOYO TOKI Co., Ltd. in May, 1917, in order to develop sanitary ware. This was followed by successive announcements of products, including Japan’s first FRP bathtub and toilet seat with hot water cleaners, which led to TOYO TOKI becoming a global manufacturer of sanitary ware. The company changed its name to TOTO KIKI LTD. in 1970, and to TOTO in 2007. The company also began domestic production of spark plugs. 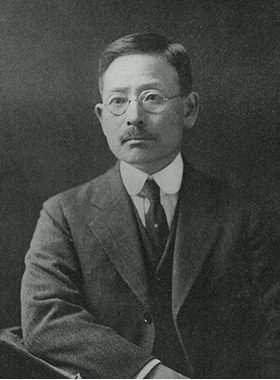 Magoemon Ezoe, who later became the NGK second president, was overcome by the desire to provide Japanese-produced plugs for the Japanese automobile industry, which was going to develop sooner or later, after visiting an American plug factory in June 1920. 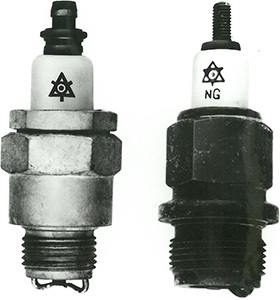 Our company began developing plugs the following year, and sales began in 1931 under the name “NG Spark Plug,” using the initial letters of Nippon Gaishi. Because the initials “NG” are associated with the phrase “no good,” the company was renamed NGK Spark Plug in 1934. The Spark Plug Division of NGK INSULATORS was spun off to become NGK Spark Plug Co., Ltd. in October 1936. NGK Spark Plug has grown to where it is now the world’s leading brand of spark plugs. 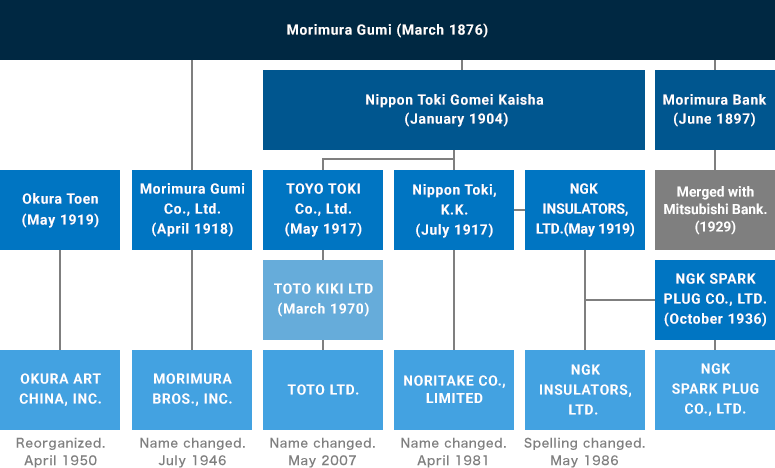 Morimura Gumi, which was founded for the purpose of overseas trade, went on to form what is now the Morimura Group together with Noritake Company Limited, TOTO, NGK INSULATORS, NGK Spark Plug, and Okura Art China, Inc.
A unique approach to business led to the creation of this group. According to this approach, having independent organizations and dedicated personnel handle new businesses results in faster decision-making, technological advancement, and greater sales, as well as clarifying business responsibilities. The spirit of the Morimura Group enterprises, described later as the “One Company for One Business,” goes back to this period.